Description: Play NBA 2K13 PC with current NBA team rosters, lineups, updated ratings and realistic gameplay sliders. This custom roster is updated as of September 15, 2013 (2013–2014 Season). The most accurate teams and players update ever for NBA 2K13 PC. NEW! Roster now compatible with MyCareer, Association, and of course, Play Now mode. - Added the following players into Free Agents: Justin Hamilton (Heat) and Arinze Onuaku (Pelicans). Note: You can assign Onuaku to the Pelicans but I prefer Pierre Jackson, although both contracts are not guaranteed. Also, I moved J. Hamilton to F.A along with Jarvis Varnado, since the Heat already have lots of players in their roster. - Updated the color and the model of the shoes. - Updated some NBA players values and signature shots, iso moves, and tendencies. 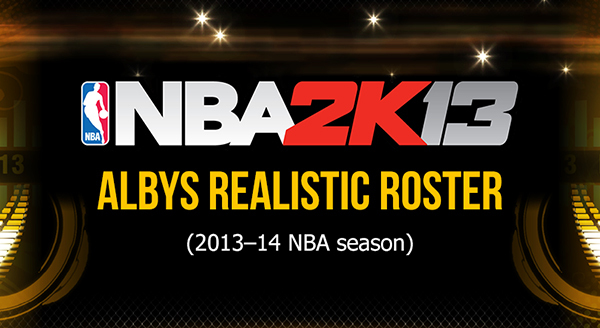 - Realistic roster for 2013–14 NBA season, accurate as of 8th September 2013. I would like thank Lakers92 for importing my RR 8.1 into the new season. - Updated overall ratings, tendencies, roles, skills, signature shots, dunk packages, iso moves, and many more. - Updated teams' coach profiles. - Updated all the teams rotations. - Updated all players' shoes and colors. - Added all new players including 2013 & 2014 rookies. - Implemented all the latest trades and transactions. - Updated accessories and colors (compatible with Tha King's Jersey Pack). - Added alternate jersey slots (daninoz project). - Includes Jampasir's HD shoes mods. - Fixed body type, skin colors and other enhancements. - Realistic gameplay with my sliders. - Real Draft Classes (2014, 2015, 2016) by Mauroth and Albys. - All features from the previous version (RR8.1). - This is my definitive gameplay. I think this is the best gameplay ever, with 2 different skills: "All star sliders" are for good players. "Supersim sliders" are for expert players. Both sliders are for All-Star levels. - Fixed real arena names. - Added RR7 version only for Blacktop mode (with all players unlocked, don't use this file for Association mode). - Various game fixes and improvements. Credits: Thank to my friends Lakers92, Daninoz, Mauroth for quality support. 1. Install all the necessary files packs #1-6 from NBA365 Project by Lakers92. Make sure you copy all the files including those in subfolders into NBA 2K13 game directory. 2. Download Albys' RR v9.1 and extract it using WinRAR or 7-zip. 3. Place the .ROS, .STG and .FDC files in your Saves folder. To find your Saves folder Click the windows start button or open run (Windows key + R) then type %AppData% in the searchbox and press 'Enter'. Open the 2K Sports > NBA 2K13 > Saves. 6. Load Albys RR settings SUPERSIM or ALL STAR. - Installing ALL the required files is a MUST in order for the game to work properly. - The SweetFX graphics mod included in the roster pack is optional to install. - You must install the Jersey Project by Daninoz to fill all the empty jersey slots (white uniforms).